Underdog stories from Spokane, Washington, usually begin on the hardwood. This one, however, starts in one lane of a recently-shoveled 400-meter track in Kalispell, Montana, which is about 70 miles from the Canadian border. 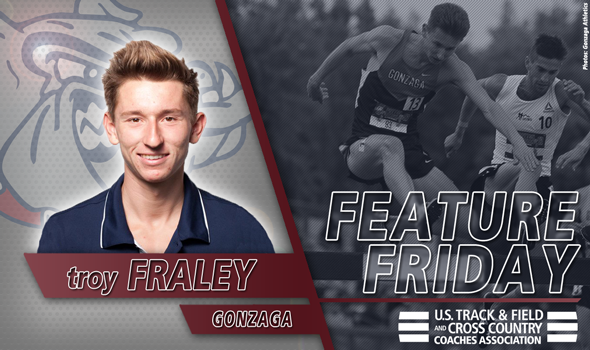 If Gonzaga’s Troy Fraley wanted to get to where he is today (read: collegiate leader in the 3000-meter steeplechase and the odds-on favorite to win the NCAA event title come June), a little snow couldn’t get in the way of progress. His coach, Pat Tyson, assigned a workout of 10 800-meter repeats over the holiday break and that’s exactly what Fraley would do. A particularly harsh week covered the track at Glacier High School (Fraley’s aptly-named alma mater) with ice and snow, and the whipping wind compounded the issue. So Fraley grabbed a shovel and cleared 200 meters of Lane 1 in two hours, then returned the next day to finish the job. Once completed, Fraley snapped a picture to send to Tyson, laced up his cross country spikes and got to work. Regular trainers wouldn’t do him any good on the remaining ice. Tyson attributed Fraley’s mindset to the redshirt junior’s upbringing in Montana. Fraley wholeheartedly agreed with his coach. That mentality carries a long way at a place like Gonzaga where the climate can be unforgiving and the track & field program doesn’t have its own facility. Instead, Fraley and the Bulldogs train at a local community college with the “hardest rubber track you could ever imagine” when the weather cooperates (treadmills when it doesn’t) and relish frequent trips to compete inside the friendlier confines of Washington’s Dempsey Indoor Practice Facility during the indoor season and at many of the California-based mega meets during the outdoor season. Fraley made a pilgrimage to Cobb Track & Angell Field this past weekend for the Payton Jordan Invitational and starred. In a race that will likely mimic what Fraley will see at the NCAA West Prelims in two weeks and possibly the NCAA Division I Outdoor Track & Field Championships in June, the redshirt junior closed in 63 seconds to finish 2nd in the slower section but notched the 3rd fastest time if both heats were combined (8:39.30). Tyson wasn’t in California with Fraley (He was organizing his team’s upcoming banquet while showing guest speaker Jim Ryun around campus), but didn’t long for updates as they streamed in from Fraley’s teammates and the assistant coach with boots on the ground. Recent success makes Fraley want to work harder, because he knows being the collegiate leader could just be temporary. After all, the collegiate leader ended up at 8:27.16 (Mason Ferlic, 2016) and 8:23.93 (Stanley Kebenei, 2015) the past two years. Fraley’s love for the steeplechase, however, won’t be fleeting. “I enjoy the aspect where it’s manageable until about three laps to go,” Fraley said. “That’s when the lactic acid starts building up. It creeps up on you and I love that kind of pain. Staying dry in any NCAA postseason race is important (Ask Ferlic about 2015) as is competing and eventually winning a title (Ask Ferlic about 2015 and 2016). If Fraley does both in the next month, you could be reading about Gonzaga’s first individual champion in any sport.